The reunited cast of Love Actually, Mrs Brown and Ed Sheeran have helped Comic Relief raise more than £71m so far. A stellar cast of comedians, musicians and other celebrities took part in the charity's 16th Red Nose Day on Friday. Highlights included a 10-minute sequel to the 2003 film Love Actually. Take That hit the road with James Corden for a special edition of Carpool Karaoke, while Sheeran made a guest appearance in BBC Three comedy People Just Do Nothing. The chart-topping star also visited Liberia to find out about the charity's work. The telethon also saw appearances from the cast of sketch show Smack The Pony, who reunited for the first time since 2003. There were special previews of Mrs Brown's new chat show and the second series of Peter Kay's sitcom Car Share. Sir Lenny Henry, Graham Norton, Russell Brand, Emeli Sande, Romesh Ranganathan, Jonathan Ross and French & Saunders also put in appearances in an attempt to persuade BBC viewers to part with their cash. Opening the show, Sir Lenny paid tribute to those affected by the attack in Westminster. "Tonight is an opportunity to save lives, to reach out in the spirit of partnership and compassion," he said. "The money you give tonight will make things better for people with tough lives here at home and abroad and your generosity year after year proves how much more there is that unites us than divides us. "Every donation is a good deed." Some viewers took to social media to complain about the quality of sound during the broadcast. The broadcast was briefly interrupted on Friday evening after Sir Lenny told parts of the audience to be quiet. During Graham Norton's segment of the evening he said: "Could you shut up over there please? It's really noisy." 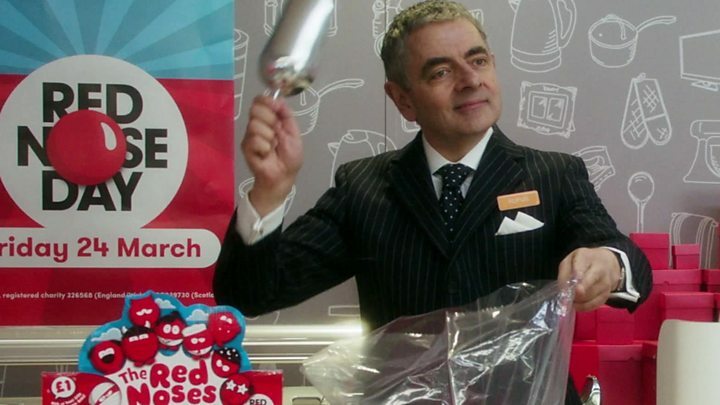 Comic Relief has raised more than £1bn since it launched in 1985. The first Red Nose Day took place three years later. Donations can still be made to Comic Relief and you can watch the BBC's Red Nose Day coverage on BBC IPlayer.